Greetings from Sayville Ford; your home for the most effective Ford service and support in the Long Island region. From tackling straightforward things such as oil changes to helping you work through collision repairs and other major problems, it is plain to see that the Sayville Ford team of devoted Ford certified mechanics are here to direct you through each step of this process. For those individuals in Long Island who have a vehicle from a different manufacturer, the Sayville Ford team would be more than willing to provide service and support to you during this important process. The people who proudly serve on Sayville Ford's expert group of service and repair professionals are more than ready to fix plenty of makes and models outside of Ford, so you can always feel comfortable knowing that your non-Ford automobile is in good hands when the time comes to drop it off for a repair. Before you review any other choice, take a moment to join us and learn exactly why Sayville Ford stands as the most trustworthy and reliable provider of automotive support in the Long Island area. From this point, chances are that you will be ready to get the ball moving on your service requirements and work out a trip to Sayville Ford in the near future. Preserving Your Wellbeing Thanks to an Unmatched Dedication to Superb Repair Standards – The Sayville Ford staff takes your safety seriously, so you can head home from our dealership confident in the fact that your routine maintenance or accident repair was done right the first time. Taking Care of Your Financial Considerations – Not looking to pay an arm and a leg for your upcoming car service? Then pay a visit to Sayville Ford and you will soon see just how serious we are when it comes to keeping you on budget. Access to the Best Replacement Components – Need to bring your Ford vehicle to the Sayville Ford service team? Then you will be pleased to find out that Sayville Ford has access to any high quality original equipment manufacturer (OEM) part needed to handle your unique service concern. The moral of the story here? Sayville Ford is the best choice in the Long Island NY area for people who want to make the most of the perfect blend of excellent service, premium support, and reasonably priced repair rates. Taking a deeper look, Sayville Ford is not just the most affordable and trustworthy provider of car repair services in town, but also the place to stop by if you are interested in leaning on the enormous stores of expertise and insight of a skilled team of Ford service techs. While you might be doubting the need to turn to the best staff of Ford mechanics here in Long Island, the truth of the matter is that these gurus have skills and training that effortlessly supersedes anything that is offered up at a local or regional repair shop. Clearly, these shade-tree operations may speak a big game or use cunning sales strategies from time to time. Despite this fact, it is still vital to understand that only authorized Ford specialists have invested the time needed to achieve this privileged status from Ford. At the same time, claiming this classification also comes with the potential to engage directly with Ford and stay abreast with all of the most recent news and insight into Ford vehicles and the best repair and maintenance methods. When it comes to keeping your vehicle in great condition, are you sincerely prepared to embrace anything less than the high quality service and raised criteria that come with hard work undertaken by a licensed Ford auto technician? Oil Changes – Leaving old, dirty, and otherwise spent oil in your motor can cause heightened friction and the eventual degradation of vital parts. Tire Rotations – Bald spots and preventable wear and tear, as well as a greater risk of roadside issues, are all signs of tires that are not consistently rotated. Timing Belt Changes – A neglected timing belt is similar to a ticking time bomb in that it can lead to extreme damage to your motor if it gets to the stage of serious degradation and fails during your daily routine. Brake Inspections – While brakes might come across as dull, sectioning off a few minutes to check these essential parts on a regular basis guarantees that they are in working order when you need to slow things down. These are just a small amount of examples that point to why disregarding scheduled service is never a good choice. The wellbeing of your car is on the line, so go ahead and reach out to Sayville Ford when the time comes to handle these often uncomplicated services. 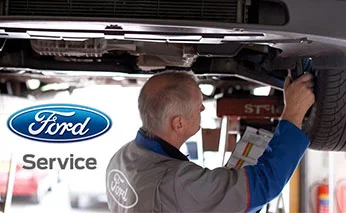 Now that you understand how imperative taking care of your recommended maintenance with a dependable business like Sayville Ford is to the longevity of your vehicle, there is no better time to connect with our certified team and craft an appropriate service timetable. To get the ball moving on this front, make it a point to give our crew of dedicated and Ford-trained auto professionals a phone call at (855) 844-7158 today. By choosing to bring your valued business to the auto maintenance team found here at Sayville Ford, you can ensure that you always get the greatest useful life out of your preferred car, truck, or SUV. Considering how important keeping your vehicle in peak shape is to your everyday routine, and your time spent traveling outside Long Island, it makes all the sense in the world to get with the Sayville Ford crew at once and get back in order with your scheduled service plan as soon as possible.